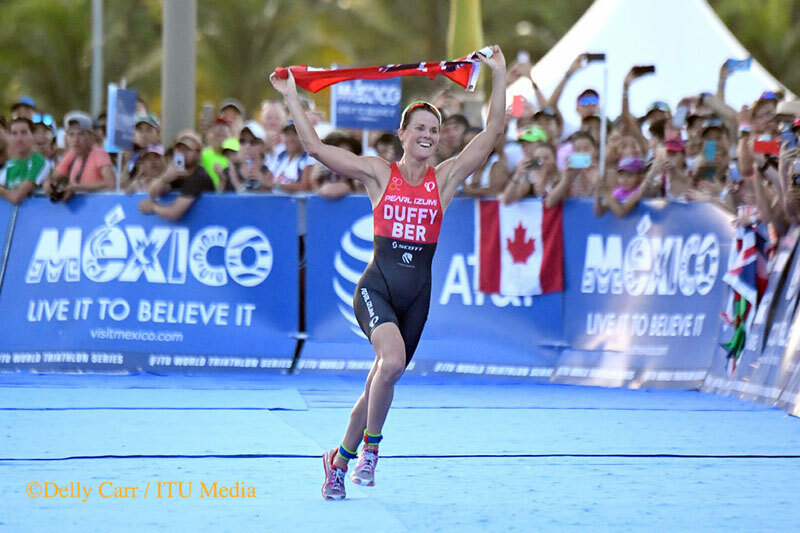 Cozumel, Mexico – Bermuda’s Flora Duffy floored it on the bike in hot and humid conditions in Cozumel, winning the race and securing her place in history as the 2016 ITU World Triathlon Series Champion. It was the first time Duffy has wont he Series, as well as the first time Bermuda has topped the overall World Championship podium. Coming into the race, Duffy was the top ranked woman in the Columbia Threadneedle Rankings, but only by 166 points. 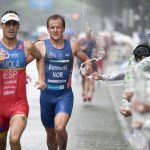 That meant she needed to either beat Olympic champion Gwen Jorgensen (USA) or come second to her, which was not going to be an easy feat considering Jorgensen had only lost two races in the last two years before starting on Saturday. But a breakaway on the bike saw Duffy run into the sun with a large enough gap that Jorgensen and company couldn’t overcome. Jorgensen ran in front of her the field to finish both second on the day and second in the Columbia Threadneedle Rankings. 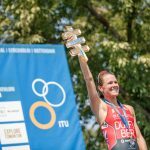 Charlotte McSchane, who trains with Jorgensen, closed out the season with her first-ever WTS podium with bronze, while Japan’s Ai Ueda finished fifth to end the season third overall in the rankings. Her season third place is the highest any Japanese athlete has ever finished. Crystal clear waters awaited the women, who were the first group of elites to crown a world champion. The course offered up only one 1500 metre swim and with the ocean current, the field essentially saw one long string of swimmers. About seven women were able to get a slight lead, Great Britain’s Jessica Learmonth and Lucy Hall along with Duffy, Jorgensen, Sarah True (USA), Carolina Routier (ESP), Pamella Oliveira (BRA). 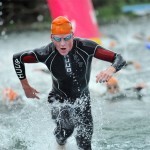 Coming out of the swim it was just a small workable lead of just five seconds that Duffy, Learmonth and Hall had over Jorgensen. But it was enough for the three to have a swift transition and push out onto the bike with no one else able to join them. Despite Jorgensen exiting the water in fifth, she could not get into the lead pack and started out the bike in a trio alongside True and Routier. The second chase group tallied a few more riders. 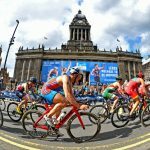 Led by all three Brit Olympians, Vicky Holland, Non Stanford and Helen Jenkins, it only took a lap and a half before they forced their group of 13 to join onto the tail end of Jorgensen and create the now main chase of 17 women. Duffy has made a name for herself as one of the strongest cyclists in the field, and it was that discipline where she needed to make the most ground if she wanted to earn the world title. This time working with Learmonth and Hall, the three continued to increase their lead after each lap. At the halfway mark of the cycle they had a gap of 42 seconds over the chase. And by the end of the cycle, that gap had increased to over a minute. Getting through the second transition, Duffy gunned it out of the gate and in no time left Learmonth and Hall to fend for themselves. The chase entered T2 down by 1:07, which meant Jorgensen had some work to do to catch up to Duffy. But she has shown to do it before, in WTS Leeds Jorgensen was down by over 90 seconds from Duffy and still was able to come back and win the race. However, at the halfway mark in the run, Duffy was still holding onto the 1:07 lead and by the time the bell rang it actually had increased to 1:14. Jorgensen is a power house on the run, but today was Duffy’s day. While she bypassed left and right the remaining field, she just could not gain any foot on Duffy. Duffy then entered the finish chute unscathed. With time to spare, she enjoyed her victory, able to grab the Bermudian flag and high-five the fans and she then crossed the finish line and collected not only her second WTS win of the year, but her first world title. Second place then went to Jorgensen, who crossed the line 1:17 following Duffy. Jorgensen then recorded enough points to maintain second place in the overall rankings and be dubbed the world champion runner-up. The bronze medal was then left up to a sprint finish. McShane and Jenkins found themselves neck and neck entering the finish chute, but it was McShane who had the final step. The third place finish gave her a first-time WTS medal. Some unfortunate mishaps out on the course saw some big names forced to pull out of the competition. Aussie great Emma Moffatt suffered a tire puncture during the first lap on the bike, where she had to end her race early. The DNF would be her final result as earlier in the week the two-time world champion announced her retirement. Holland also had an unlucky fate on the day. A small bike crash during the second lap on the bike with Kiwi Nicky Samuels caused Holland to have to pull out of the competition.